Botanical art is very active in the UK - there are lots of places where you can see botanical art. Exhibitions are now split across various pages to make them much more accessible to view. ​How these categories work is explained in more detail at the bottom of this page. 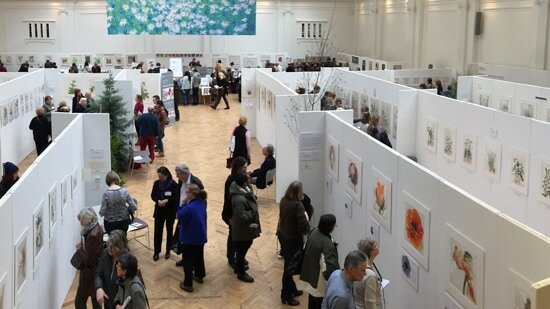 The major horticultural societies in the UK have annual juried exhibitions of botanical art and illustration. These prestigious exhibitions attract artists from all over the world. In some of these you can view original artwork by past masters by arrangement / prior written request. Past Exhibitions at the Shirley Sherwood Gallery of Botanical Art (2008-2016) - the ONLY Online Archive Record of these exhibitions in the world! This is another way of looking at how exhibitions are organised - within the UK and on this website. 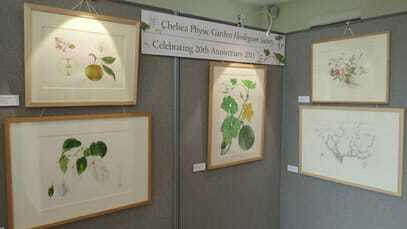 primarily the Shirley Sherwood Gallery of Botanical Art at Kew Gardens. Occasional exhibitions include art for sale. The listing below includes details of past exhibitions and associated catalogues and reviews. Minor exhibitions are regularly held at the Royal Horticultural Society at its Lindley Libraries in London and the RHS Gardens - typically of work from the Lindley Collection. Note: These might also have entries from international artists but this is a much smaller percentage of the entries. Regional/Local Botanical Art Societies and Florilegium Societies tend to have a focus on location. Botanical artwork can be bought in exhibitions held in galleries and other venues. Do you know about a Botanical Art Exhibition? The only exhibitions eligible to be included are those solely devoted to botanical art and/or illustration.